In this article today I want to show you some of the most effective dryland training drills that you can do in order to start becoming a faster, more conditioned, and agile hockey player. Hockey itself is both an art and a science in terms of what it takes to prepare the athletes for a game. Dryland training is no different. That is, to what degree is the exercise you’re doing specific enough to hockey in order to have a high degree of transfer to an on-ice setting, which can vary in of itself in many ways. Some exercises transfer to explosiveness, some will fair better towards your conditioning levels, whereas others may have a higher degree of transfer to your agility. 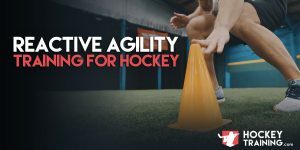 Let’s go over some of my favorite exercises that you can do, ideally with a partner or with your team, that will have the highest degree of transfer and improve your overall hockey performance. What you’re going to do here is set up two cones that are 15 yards apart and lateral shuffle your way there and back non-stop. This would account for one rep and you would ideally repeat this four times with 60 seconds rest in between. The reason I like to use this movement pattern across these specific distances is that it creates an excellent marriage between training both your lateral explosiveness and your lateral endurance at the same time which will have a very natural carryover to your on-ice skating stride. Beyond this, the low center of gravity and overall lateral nature of the movement demand replicates the joint angles of skating in a very efficient way to increase the overall specificity of the exercise. Of important note, I do not want you to cross your feet at all during this shuffle. It is a shuffle exercise, not a crossover step or carioca exercise. In this exercise, you’re going to need to create a perfect square with four cones. The size of the square you make is going to determine the degree of difficulty required in order to stay away from whoever is “it”. Your square can be 5 yards distance, 10 yards distance, or even 15 yards difference, it doesn’t really matter. In most cases, I recommend starting with a 10-yard distance between each cone and working from there based on the ability of the athletes. How it works is you’re both going to lie down with the top of your heads facing each other, one athlete is determined to be “it”, and once the whistle blows (or you count yourselves down) the one who is “it” needs to two-hand touch the athlete who is trying to get away. This is an excellent dryland drill for hockey specific agility because it will force you to remain explosive in both a forward and lateral plane of motion, and you will also find yourself backpedaling quite a bit as well to “round off” the overall athleticism required to perform this exercise. Beyond this, the reason I like it so much for agility is that it is reactive in nature. Meaning, you’re not just running around cones in a predetermined movement pattern. Instead, you’re truly reacting to your opponent just like you would have to in a chaotic on-ice environment. When you understand this and start incorporating it into your training you then start effectively training both the body and mind for optimal performance. Lastly, this exercise will also become very fatiguing as the sets go on, so it naturally trains your agility-specific conditioning as well. One game of tag where you are both “it” equals one rep, repeat for five reps total with zero rest at all in between games. You may already be familiar with an exercise we have done many times here on HockeyTraining.com called the mirror lateral shuffle drill. This dryland drill is a similar concept, but with this exercise I want you to sprint forward. How it works is you’re going to have one leader and one follower who is immediately behind that leader. You’re going to have a predetermined distance between each other of 5-20 yards and the follower has to replicate everything that the leader is doing. The leader can sprint forward, stop, or backpedal at any moment during this drill. The follower must do exactly what the leader does and react as fast as possible to the change in movement. I really like this exercise because the follower is training their reactive agility, but the leader is training their agility on a completely different level where they are trying to fool their opponent (which is something you always use out on the ice when trying to blow by your opponents). 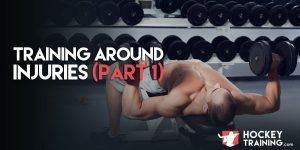 For this exercise I want you to cover 15 yards of distance and once you both have been the leader that counts as one rep. Repeat for five total reps with no rest in between. The final exercise we are going to go through today is the 3-Point agility cone drill. How this exercise works is you are going to have three cones separated 5-10 yards apart from each other in a straight line. The leader is going to call out the cone that the follower has to immediately react and sprint to (and touch with his/her hand), but, return to his/her starting line 5 yards behind the cone. This is a great exercise that trains your auditory agility (a different compartment of the brain that improves agility), explosive speed, speed of decision making, and conditioning. Do this drill for 20 seconds non-stop, rest 60 seconds, and repeat for five total rounds. B: Get Up Tag (over when tagged)- when both have gone = 1 rep. Repeat 5 times with no rest. C: Mirror Sprints x 15yds- when both have gone = 1 rep. Repeat 5 times with no rest. D: 3-Point Agility Cone Drill x 20secs. Repeat 5 times with 60secs rest. A properly designed hockey dryland training workout must include all of the right drills in order for it to have true carryover to an on-ice setting. Naturally, a single workout will not net a hockey player consistent results over the course of months or years at a time, so, a full program is always recommended in order to truly reach your hockey potential. 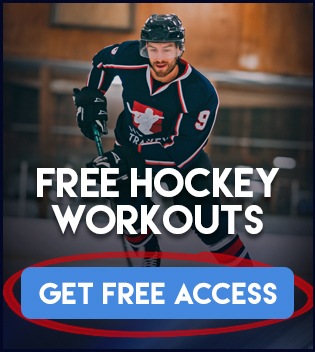 Check out the Hockey Skills Accelerator VIP Membership here at HockeyTraining.com and gain instant access to every single one of our elite programs so that you don’t just know what to do today, but you know exactly what your next year of training is going to look like in order to take you from good to great.